Today, we’re sharing Chauncey’s sixth deepest desire for this year’s holiday season. He wanted to be showered with dog treats from Ava’s Pet Palace. And we happened to make this dream come true. Photographic proof below. One mae not be abl t0 tell by looking at my slimm, peteet figur, how very treet motivatid I am, but I will do most thingz for food. And this iz tha food I want the mosT of. I kin not beleev you creatid a ring of Ava’s Pet Palace dog treats that I’m blessd t0 sit in the midle of. I have no wae of opning theez without ur help. Pleez opin them and let me eet them all. Hav I told u you’re flawless yet t0day? 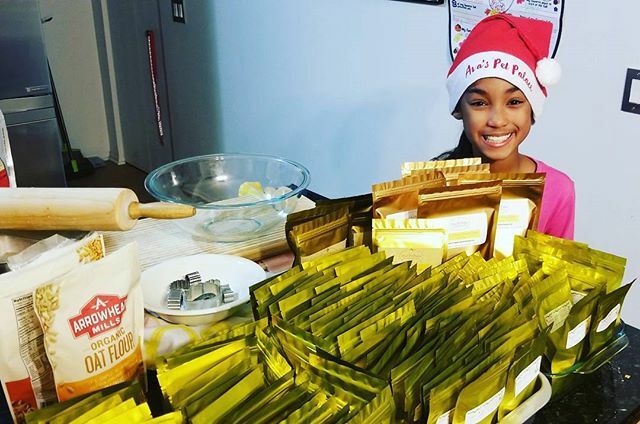 Rover-Time is so excited to feature this inspiring, 10-year old entrepreneur from Chicago. Ava opened her small business because she believes animals should eat as well as her very own family strives to eat. She created yummy treats using only the best, non-GMO ingredients that all animals can enjoy, even ones with allergies to wheat, corn, or soy. 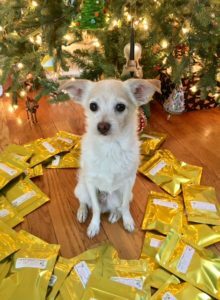 This holiday season, Rover-Time is sharing sample packs of Ava’s amazing treats with all of their daily dog walking clients as a thank you for their ongoing support of our small business. We hope the partnership will encourage you to purchase from Ava down the road because Ava’s Pet Palace truly embodies exactly what we need support these days. To learn more about Ava and her budding business, visit her website here. You can also follow her on Instagram and like her business on Facebook.